On August 24th, at 6:00 pm, the Tampa Hillsborough Expressway Authority hosted a Virtual Town Hall Meeting on the General Overview of the Selmon Extension. This was the first in a series of Virtual Town Hall Meetings. If you missed the meeting or would like to replay the meeting, you can do so by watching the video below. 1 End date 2020. Hopefully this will be early 2020 or sooner. Any chance of early completion? Our current schedule is for a early 2020 completion. 2 When do you expect actual construction to begin? Thank you for your question. This will be covered in the presentation but we anticipate construction to begin in late 2017. 3 Why just one lane in each direction? FDOT has no plans in a 50 year horizon to replace the Gandy Bridge. Because only 40% of the traffic is regional, only one lane is needed effectively handle the present (and future) regional traffic. The Selmon Extension lanes will be free of traffic signals which means they can carry many more trips. The new lanes will provide a non-stop trip between the current western terminus of the Selmon Expressway and the western end of the Gandy Bridge in Pinellas County. 4 Will Gandy be down to one lane of traffic going each way during construction? two lanes in each direction will be maintained during peak hours. 5 When does construction start Thank you for your question. This will be covered in the presentation but we anticipate construction to begin in late 2017. 6 When will construction start? Thank you for your question. This will be covered in the presentation but we anticipate construction to begin in late 2017. 7 Will tolls be increased for whole crosstown or just additional for the extension part you travel? there will be a separate toll for the Extension, the amount of which has not yet been determined. Tolls on the Selmon Expressway will remain the same. 8 Will we hear the discussion online Yes, you should hear the audio through your computer speakers. Please refresh your browser window and make sure your speakers are turned up in order to hear the audio. 9 The invitation’s drawing shows a new southward entrance to Selmon at Dale Marby. How does this affect the existing exits 1A and 1B? Thank you for joining tonight. All existing entrances will remain with a new southward entrance added as referenced in the drawing. 10 What will be the sound barrier methods to reduce traffic noise for residents by Gandy Blvd? a new noise study will be preformed according to FDOT standards. This noise study will identify locations where approved noise barriers may be utilized. 11 St. Petersburg saw heavy construction during the night for the extension. How will this be prevented for South Tampa? What about possible impacts of construction delays? construction will occur during night, when traffic flow on Gandy Blvd is minimal. THEA will be respectful to surrounding Gandy neighbors. 12 How tall will it be? There are many cables crossing Gandy. Will traffic flow on Gandy be interrupted? Thank you for joining. The lowest point in the bridge structure is 30 feet above the ground. All electrical distribution cables will be buried underground. Two thru lanes in each direction will be maintained during all peak hours. 13 How will THEA compensate the existing businesses The Selmon Extension is located in the median of Gandy Boulevard. We will not be purchasing any right of way; no businesses will be impacted. However, THEA will continue to work with Gandy corridor businesses to minimize impacts during construction. 14 Whycant you synchronize the lights to improve flow? The signal timing systems will be reconfigured at the completion of the project to improve traffic flow based upon the new traffic patterns. 15 Businesses will lose customers and $$ while the extension is constructed. How will THEA compensate them for loss of business over the construction period? The Selmon Extension is located in the median of Gandy Boulevard. We will not be purchasing any right of way; no businesses will be impacted. However, THEA will continue to work with Gandy corridor businesses to minimize impacts during construction. 16 One of the main reasons THEA uses for installing this structure is that the businesses along Gandy will experience an increase in business due to rush hour traffic being less. The projected reduction in the number of vehicles is certainly not enough to make Gandy’s rush hour traffic so much better that people will be more inclined to visit a business on Gandy during peak traffic times which ensures there will be no increase in business during rush hour. Why has THEA not included this very important information in any of their data and propaganda they have provided to the people? Thank you for your question. Our traffic analysis with the Extension in place shows a significant time savings for drivers on Gandy Boulevard. Signal wait times would be reduced by an average of 44%, and end-to-end Gandy Boulevard travel times would be cut by 40%. When compared to no-build option these time savings would be sustained over the entire 30-year planning horizon. As a result, customers driving to Gandy Boulevard businesses will have enhanced travel times on Gandy Boulevard. Preliminary economic studies from the University of South Florida indicates these time savings for destination-businesses would benefit from the improvement. That study will be out in September and we will post on the Selmon Extension website. 17 So you are saying that you are not going to use any tax payer dollars? Thank you for joining us Sarah.The Selmon Extension will be built with zero tax dollars. All funding will utilize toll revenues from Expressway users and toll bonds sold by the Expressway Authority. THEA toll bonds are not state debt. 18 How will this help alleviate North Bound traffic delays from MacDill Air Force Base to Gandy Blvd, including S. Dale Mabry Hwy, S. Manhattan Avenue and S. West Shore Blvd? This project will remove a large portion of the turing traffic at the Gandy Dale Mabry allowing longer greens times for Northbound thru traffic during the afternoon rush hour. 20 The mailer that was sent out by Constant Contact had a rendering that showed pretty landscaping below the huge concrete overhead bridge. Nothing grows under the existing elevated crosstown along Hwy 60. Why should we believe that anything will grow under this new proposed bridge? This Bridge will be over 12 feet higher than the existing Selmon bridge allowing more sunlight during the day for landscaping growth. 21 So you can destroy neighborhood property values to serve regional travelors? Since the early 90s, there have been discussions and concerns with the traffic on Gandy Boulevard. Many projects have been proposed, but those projects took many residents homes and area businesses. The Selmon Extension takes no homes, no businesses, is built in an existing median and is being paid for by toll revenues. Not tax dollars. This project is needed for efficient movement of goods and people, and for evacuation purposes. Project concerns have been received and addressed. The proposed improvement is consistent with local, regional, and state transportation plans. It will address current and future needs of the region for travel, business, and emergency evacuations. 22 What do you mean by public art? Will it be murals on the stantions? Distracting and possibly ugly depending on individual tastes. Thank you for joining and for your question. Public input will be sought to develop pier aesthetics, including textures and colors as well public art in appropriate locations to beautify the project. 23 Higher structure spreads the traffic noise further into residential areas the higher structure results in noise waves dissipating at higher elevations, minimizing noise impacts to adjacent property owners. 24 How many traffic lanes will there be on the extension. Thanks for joining us this evening. Because only 40% of the traffic is regional, only one lane each way of the Selmon Extension is needed effectively handle the present (and future) regional traffic. 25 What about the businesses, loss of revenue during construction? The Selmon Extension is located in the media of Gandy Boulevard. We will not be purchasing any right of way; no businesses will be impacted. However, THEA will continue to work with Gandy corridor businesses to minimize impacts during construction. 26 The Constant Contact survey had only 888 respondents which is a very small sample. The online survey could also be taken multiple times by the same person which could have tilted the result in favor of THEA’s desired result of having public support. How can this survey be considered to be credible? Thank you for your question. The constant contact survey is only one outreach effort we are doing to gather public and business input. We are committed to engaging with the Gandy area community and will continue to seek your input. 27 Where will the toll booths be located on the extension? The toll gantries will be located in the existing Selmon interchange area at Gandy Blvd. 28 When is construction slated to start on the Tampa side of the bay? the project has anticipated late 2017 construction start date. 29 The Constant Contact survey had 888 respondents with 54% saying the pretty color (and misleading) rendering ‘looked like a good idea’. 54% of 888 is only 480 positive responses. In 2009 the Save Gandy opposition group had more than 1,000 signatures of people opposing the project. How can THEA honestly feel like they have public support for the project? Thank you for your question. This project benefits a wide area of the Tampa Bay community. That said, many local businesses and residents in the Gandy corridor support this project, including the South Tampa Chamber of Commerce. The proposed improvement is consistent with local, regional, and state transportation plans. It will address current and future needs of the region for travel, business, and emergency evacuations. 30 Safety features of the extension? What would prevent a car that was in an accident from hydroplaning/falling off the extension causing possible injuries below? Any precautions? thank you for the question. Standard barrier walls will be located both along the outside and along the media of the Extension to contain vehicles in the event of an accident. 31 And its completion date? anticipated completion date is early 2020. 32 Bridges are shut down during winds associated with hurricanes. This destroys the extension,s use and the Gandy Bridge’s use, the west side of which floods in storms. Not a good hurricane evacuation route. Thanks for joining us tonight. Residents will be asked to evacuate 72 hours prior to landfall. The three bridges will not be closed until closer to the storm making landfall. 33 There is no logic in this concept. traffic heading North from the base must still cross Gandy to access the extension. The traffic back up occurs in the North Bound lanes prior to reaching Gandy. How will the extension relieve that build up without the extension also starting/ending near the base thank you for your question. The current 2016 study shows that the average daily traffic on Gandy Boulevard from Gandy Bridge to Dale Mabry is 45,175. We estimate that approximately 40% of weekday trips now and in the future, will use the Extension. Thats approximately 16,000 vehicles per day. This number will grow significantly over the next 30 years. In addition to the investment grade traffic and revenue study, we are also counting how many cars come over the Gandy Bridge and then either get on to the Selmon Expressway, or go to MacDill Air Force Base. These drivers would be the primary users of the Selmon Extension. That report is expected to be complete in January of 2017. 34 how much increased volume do you anticipate on existing selmon expressway? There is a traffic and revenue study currently underway to predict the increase in traffic. 35 Your response to my question about landscaping not growing under the overhead roadway states the Gandy overpass is 12 feet higher than the existing elevated expressway along Hwy 60. This is factually false. 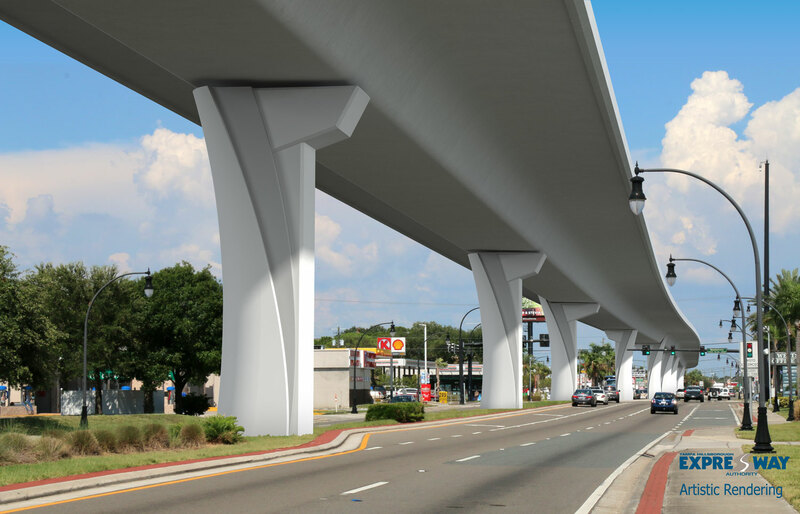 The existing elevated expressway along the south side of Hwy 60 near the Port of Tampa is NOT only 18 feet high. Can you please explain your answer? Apologize, thought you meant the intersection of Gandy & Dale Mabry. Yes, on highway 60, the bridge is quite tall, but it’s 8 lanes, with the three lanes of the REL above that. Very difficult for light to get through. In addition, that area was used for storm water management facilities. Therefore no landscaping was planned for that area. 36 How much did you says the toll cost expected to be? thank you for your question. it is not yet known at this time what the Extension toll will be. 37 So the Gandy Bridge is going to be a double-decker? thank you for your question. FDOT has no plans in a 50 year horizon to replace or double deck the Gandy Bridge. 38 How are you going to merge onto Gandy Bridge? thank you for the question. Traffic from the Extension will merge onto the Gandy Bridge with existing lanes. 39 Is the Ad in November 2017 or LOI Due? the anticipated advertising date is in November or December 2016. 41 2 Lanes open: does that mean 1 lane in EACH direction during construction, two lanes will remain in each direction during peak hours. 42 2 lanes each direction ? thank you for your question. During construction, two lanes will remain in each direction during peak hours. 44 Did I understand the presentation correctly that the extension will only be two lanes with one going in each direction. Thank you for your question. The Extension will add 2 lanes (one in each direction) to separate Gandy corridor through trips from trips destined for Gandy Blvd. This provides significant traffic relief on Gandy Blvd that will provide sustained travel time savings through the foreseeable future. 45 If the overhead roadway is built Gandy’s neighborhood main street character will be destroyed. Why should a massive concrete structure that ruins the main street feel be installed to alleviate some traffic for 3 to 4 hours a day, especially when the commuters who get to save a few minutes do not even live in the Gandy area? At build out, The Gandy Extension will significantly alleviate traffic congestion along Gandy Blvd. by segregating pass through commuter traffic from neighborhood traffic. The Gandy Extension will reduce travel times while greatly improving hurricane and other emergency evacuation safety protocols. 46 Is the extension going to be on lane in each direction or two? The Extension will add 2 lanes (one in each direction) to separate Gandy corridor through trips from trips destined for Gandy Blvd. This provides significant traffic relief on Gandy Blvd that will provide sustained travel time savings through the foreseeable future. 47 Do we have a graphic projecting what the on & off will look like? Thank you for your question. We are currently having a graphic of the ramp being designed and it will be posted on the Tampa Hillsborough Expressway website. Also, please go to http://www.tampa-xway.com/contact-us/ to sign up for our newsletter to stay in touch regarding the project. 48 why not 4 lanes on the extension, will be needed in near future. Thank you for your question. FDOT has no plans in a 50 year horizon to replace the Gandy Bridge. Because only 40% of the traffic is regional, only one lane is needed effectively handle the present (and future) regional traffic. 49 How many exit and entry ramps? Where is the space to flow into Gandy Bridge? Are you going to widen Gandy Bridge, it is already very heavy traffic at rush hours. Thank you for your question. The Selmon Extension will provide direct access between the Lee Roy Selmon Expressway and Gandy Bridge. Traffic will merge onto the Gandy Bridge using existing lanes. FDOT has no plans in a 50 year horizon to replace or widen the Gandy Bridge. 51 how and when will businesses have input as to the pier locations Thank you for your question. We plan to have our next town hall meeting in October on pier design options. We hope you will participate! 52 Will the sidewalks on Gandy remain the same size? Or will there be support columns from the extension blocking the sidewalk? Thank you for your question. The sidewalks will remain the same size. The extension will be built in the median of Gandy Boulevard. 53 will the tolls be increased on all of the Selmon roads Thank you for your question. We are still determining the price for the Selmon Extension but existing tolls on the remainder of the system will not be changed. 54 I see the veterans expressway is ongoing for the last 10 years with no finish in sight. Will this project be managed by the same people/company? Thank you for your question. The Veterans Expressway is managed by Florida’s Turnpike Enterprise. The Selmon Extension is managed by the Tampa Hillsborough Expressway Authority. 55 What is the noise impact for the neighborhood? Thank you for your question. Construction noise can be anticipated but will occur more at night than during daylight hours. In addition, the after effects of this type of construction lower the noise volumes on Gandy Blvd. 56 What kind of noise factor will there be during night construction? The contractor will be required to minimize noise during nighttime construction, however there will be unavoidable evening construction noise. 57 How about the people going to Pinellas. Those leaving Tampa to Pinellas will not have to stop at the lights along Gandy Blvd. if they take the Extension or they would have the option of staying on Gandy. 58 Is the toll price expected to at indefinitely or is there a time period during which the toll will be charged? Thank you. The toll will be charged at all times except for emergency evacuations. 59 What will be the price of the tolls on the proposed extension? At this time, the price of the toll on the Extension has not yet been established. 60 I tuned in late and may have missed it. What is the projected toll going to be to utilize this extension? Thank you for your question. At this time, the toll for the Extension has not yet been established. 61 Ae Gandy and Dabry the only entry points in South Tampa? Will there be an entry near West Shore Blvd? Thank you for your question. Travelers can access the Extension from either the Gandy Bridge, Dale Mabry or the Lee Roy Selmon Expressway. There will be no entry/exit on West Shore Blvd. 62 In your response to my question regarding the Constant Contact survey having far fewer positive responses than the number of people who signed the opposition position, you said THEA will continue to seek our input. We do not feel this is genuine. Why have there been no public meetings like in 2009 so the neighborhood residents can show up to protest something that ruins their neighborhood main street? Thank you for your question. The Virtual Town Hall is the first in a series. This method of outreach allows more people to participate in the comfort of their homes, plus it will be available on-demand, 24 hours a day, via our website at www.selmonextension.com. 63 When will you know what the toll price will be? Thank you for your question. The toll price will be determined upon completion of the traffic and revenue study currently underway. 64 How will exterme rainfall impact Gandy Blvd from the extension? Thank you for your question. All stormwater runoff from the new structure will be piped directly from the existing underground outfall structures along the north side of Gandy Blvd thus reducing the effect on Gandy Blvd. 65 how much extra will it cost? Thank you for your question. Tt is not yet known at this time what the Extension toll will be. 66 So all traffic will bottleneck at the bridge? Thank you for your question. The Extension will add one lane of traffic for regional travelers. This will improve traffic on Gandy Boulevard for local traffic.FDOT has no plans in a 50 year horizon to replace the Gandy Bridge. Because only 40% of the traffic is regional, only one lane is needed effectively handle the present (and future) regional traffic. 67 Have the bonds been approved and by what authority? How will cost overuns be funded? Upon approval of the traffic an revenue study, THEA will go to the bond market to sell bonds for project funding appropriate contingency funding will be including to handle costs overruns. 68 Where is the interchange area at Gandy Blvd? Where the existing Selmon Expressway crosses Gandy Blvd. 70 Hello, will all financing be in place prior to start of construction or will financing be a part of the contract to build the project? We will have the financing in place before the start. 71 How far away will you see the bridge from the neighborhoods and will noise be a factor? From the neighborhood perspective, local tree cover will minimize the visual impact of the extension. We are currently doing a noise study to determine areas that need sound barriers. 73 So confused about how the lanes will converge before the bridge… Thank you for your question. Westbound traffic coming down from the overhead bridge will enter an additional third lane on Gandy Blvd. Appropriate merge areas will be provided to reduce down to two lanes before the Gandy Bridge. 74 Are the additional turn lanes proposed for Westshore still in the works. The Extension will remove enough traffic from existing Gandy Blvd to eliminate the need for dual left turns onto Westshore. Existing turn lanes will be lengthened. 75 Have any sound studies been done for Culbreath key residents? we are forty feet up. higher up is not better fo us. A new noise study will be preformed according to FDOT standards. This noise study will identify locations where approved noise barriers may be utilized. 78 Where does the extension join the existing Gandy Bridge? Thank you for your question. The Extension entry ramp will be just to the east of the Marine Corps facility. 79 Where will the weekly on-site meetings be held during construction? Answering you question now vocally, but the answer is, yes. 80 What is Pinellas doing on that side to tap in Thank you for your question. They are two separate projects. 81 Thank you, looks like all my major concerns have been addressed in this presentation and it looks like a great benefit for all! Having the capability to exit South bound onto Dale Mabry will significantly improve my commute back home. 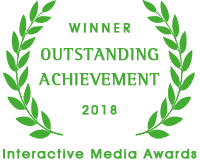 Thank you for your input! 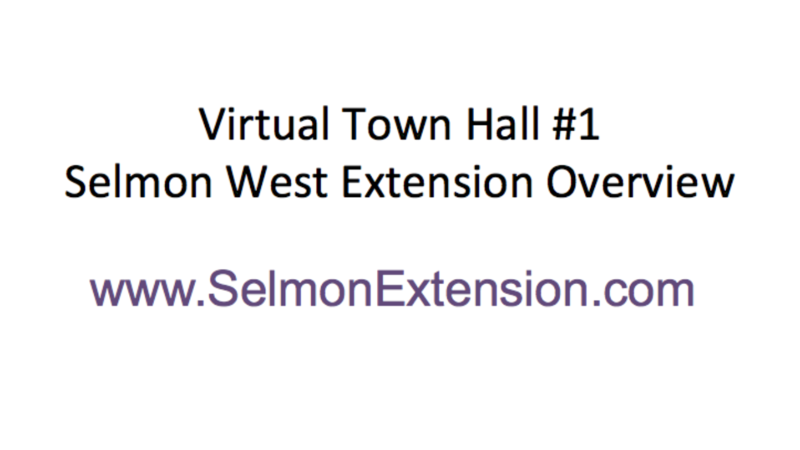 Please feel free to visit the Selmonextension.com for any additional questions you may have. 82 But the noise will increase, just not significantly? Thank you for your question. The noise study will identify any areas of significant increase and noise mitigation methods will be utilized. 83 Is the person who is answering the questions during this virtual meeting going to tell everyone that if the overpass is built the rush hour traffic on Gandy is still going to be very bad and the local residents should not expect otherwise? Thank you for your question. Rush hour traffic will be significantly improved, however as you have noted it will still be rush hour traffic. 84 How will the water runoff from the raised level affect the lower level? where does it go? Thank you for your question. All stormwater runoff from the new structure will be piped directly from the existing underground outfall structures along the north side of Gandy Blvd thus reducing the effect on Gandy Blvd. 85 So we will be able to exit and enter the same way even during construction? Yes. 86 Thank you. Will the two lanes on the extension be divided by a concrete barrier. Yes. 87 Noise impact affecting residents South of Gandy? Thank you for your question. A new noise study will be preformed according to FDOT standards. This noise study will identify locations where approved noise barriers may be utilized. 88 Any consideration to adding sound walls to diminish traffic noise along existing expressway? Thank you for your question. A new noise study will be preformed according to FDOT standards. This noise study will identify locations where approved noise barriers may be utilized. 89 Will the power lines be removed from the sides of Gandy? All the existing electrical distributions currently crossing Gandy Blvd will be moved underground during the project. 91 Have you guys done a presentation at our location or is one planned? Just wondering.. The Virtual Town Hall allows people to participate from the comfort of their homes rather than having to drive to a location after work. Having a recording of the Town Hall on the website gives the information a wider audience, again at a time and place that is convenient for them. Also, we will come out and speak to you or your civic group about the extension or answer any questions you might have. Simply go to www.selmonextension.com, go to the Contact Us form and fill out the information. 92 during construction, will consideration be given to those businesses that are open 24 hours? you mentioned lane closures in the evening. During construction, THEA expects the contractor to minimize median turn lane closures. Temporary closures of some median-turning movements will occur during foundation construction. However the closures, if required, would be for short durations and usually at night. The final project will preserve all existing median-turn movements. Since this project is constructed in the median of Gandy Boulevard, THEA will not be impacting the driveways of businesses along Gandy Boulevard during their peak business hours. There will be weekly meetings with THEA and the business community, and an on-site dedicated public information officer. This will allow businesses a forum to address issues and will help to insure that timely and accurate construction information is distributed to the businesses and the community. There will also be weekly construction updates, so again, I urge you to go to selmonextension.com and sign up for the updates. 93 Will a permit from SWFWMD for stormwater treatment or attenuation be required for this project? Yes, we are obtaining a permit from SWFWMD. 94 How will the water runoff be cleaned before running into the bay? We will over treat storm water runoff in the existing interchange area ponds. 95 How will the new extension effect sound? We are in the process of updating the Project Development & Environmental (PD&E) study and that document will include a noise impact study. The updated PD&E study will be posted on www.selmonextension.com. 96 Does THEA prefer a segmental bridge as shown in the rendering? Both concrete and steel structures are currently being evaluated by THEA. 98 Will there be an exit on 4th St The Pinellas project is a Florida Department of Transportation project. The Express Lanes will have frontage roads, so that you can get to 4th and 9th. If you’re on the overpasses in Pinellas, you’re not stopping – you’re a regional traveler, just trying to get through the corridor. 99 Will THEA be holding one or more public meetings so the Gandy neighborhoods’ residents can show up to voice their displeasure of having their neighborhood main street ruined and still having to deal with horrible rush hour traffic? The Virtual Town Hall allows people to participate from the comfort of their homes rather than having to drive to a location after work. Having a recording of the Town Hall on the website gives the information a wider audience, again at a time and place that is convenient for them. 100 Please explain the interchange s at Dale Mabry again thks The interchange will have the same movements that is has today. If you’re on the Expressway you can get off on Gandy Boulevard and go either east or west. With the extension in place, those options will still be available PLUS the option of staying on the extension to the Gandy Bridge. 101 will businesses have input as to the location of the piers so as not to dissect the entrance of a business? Thank you for your question. We plan to hold our next virtual town hall meeting in October on the topic of pier design. We hope you will participate! 102 how does the noise of traffic on the bridge expected to affect the residents? Thank you for your question. A new noise study will be preformed according to FDOT standards. This noise study will identify locations where approved noise barriers may be utilized. 103 Are there any aesthetic requirements associated with the superstructure and/or substructure, i.e. closed box, segmental, etc. We will continue to seek public input for pier aesthetics and landscaping. Please refer to our Selmon Extension Website www.SelmonExtension.com to sign up for updates and input. 104 Is there any restriction in terms of left turn closures during construction? Thank you for your question. Any potential turn lane closures will be during non-peak business hours and will be as brief as possible. 105 The current exit and entrance to the Selmon is extreamly dangerous during rush hour. What are the plans to fix this? Thank you. The existing eastbound auxiliary lane between the exit and entrance ramps will be extended east to Gandy Blvd., providing an exclusive southbound turn lane. This will reduce the weaving movements and improve safety. 106 What happens when the road west of the bay is flooded at the entrance to the extension? Residents will be asked to evacuate 72 hours prior to landfall. The three bridges will not be closed until closer to the storm making landfall. 107 Has the contract been awarded? If so..what construction Co? Thanks for joining us. The contract has not been awarded yet. 108 Is there a redesign for the cloverleaf intersection on the southwest corner of Gandy and Dale Mabry for the new extension. Currently, the Gandy outside eastbound lane allows exiting, and entering traffic to crisscross. Thank you. The existing eastbound auxiliary lane between the exit and entrance ramps will be extended east to Gandy Blvd., providing an exclusive southbound turn lane. This will reduce the weaving movements and improve safety. 109 Will the new extension effect the noise level to residents ? Thank you for your question. A new noise study will be preformed according to FDOT standards. This noise study will identify locations where approved noise barriers may be utilized. 110 Is there a new West bound off ramp to Dale Mabry being constructed to elimenate the amount of traffic on the looped ramp on Gandy for drivers heading North on Dale Mabry? Thank you for your question. A new West Bound off ramp to Dale Mabry will be somewhat reconfigured to improve safety and operations. 111 The cut and cover option is the only option that will maintain Gandy’s main street character, and it is shown to be the most expensive option. THEA has stated to us they will not pay for this. Has THEA reached out to the FDOT to discuss supplemental funding to pay for this? FDOT has no plans to do any improvements on Gandy Boulevard. 112 Are there any emergency pull off lanes on the raised expressway or just two lanes fortraffic only Thanks for joining us. There will be plenty of room on the shoulder should you need to pull over on the Selmon Extension. 113 Will the timing be affected by the pinellas construction? Thanks for joining us tonight. No, the timing of our project will not be affected, as they are two different projects being done by two different agencies. 114 WHY AREN’T YOU ANSWERING ALL OF MY QUESTIONS???? Please be patient we have a lot of attendees and are trying to answer all the questions as quickly as possible. Thanks for patience. 115 Will there be any roadway lighting on the bridge? Yes, and we are looking at ways to minimize the spill over. 116 what are the plans for the Gandy Blvd. upgrade; sidewalks landscaping, bike lanes? Adding bike lanes would require right of way acquisition on both sides of Gandy from existing businesses. The Selmon Extension will be located in the media of Gandy Boulevard. We will not be purchasing any right of way; no businesses will be impacted. 117 Not sure who did the math, but 16,000 is not 40% of 45,175. Nor does it take into consideration the flow north from the Base, which still has to cross Gandy and will still cause significant congestion South of Gandy. I think it is a great idea as far as relieving, traffic across the bridge, but it will not ease the congestion leaving the base and heading north on either Manhattan or Gandy. The only way to do that is to add a direct access to the extension from the Base. Thank you for your question. There will be an entry to the Selmon Extension from Dale Mabry, just north of Gandy Blvd. 118 Thank you. I will patiently await a response to every question I asked, because they are all very important to me. I did document my questions. I would like to share your responses to the many people (friends and neighbors) who strongly oppose this project. Thank you. We have answered every question in the queue to this point in time. We will answer each and every question as quickly as we can. We appreciate your patience. 119 I know my questions are critical, but they are all very valid. It would have been nice if the person answering live would have addressed them. Ignoring questions that show the negative side of a project is misleading and diminishes credibility. Thank you for participating tonight.